The first Airbus A330-800 took off Tuesday morning from Blagnac Airport in Toulouse for its maiden flight over southwestern France. The aircraft, MSN1888, will perform the dedicated flight-physics tests required for the smaller variant of the A330neo family, launched in 2014 as a more fuel-efficient replacement for the A330-200. Plans call for the Rolls-Royce Trent 7000-powered A330-800’s certification development to last around 300 flight-test hours, allowing for planned EASA approval next year. Its sibling, the larger A330-900, recently completed its development testing and certification program, validating the A330neo family’s common engines, systems, cabin, and flight and ground operations. 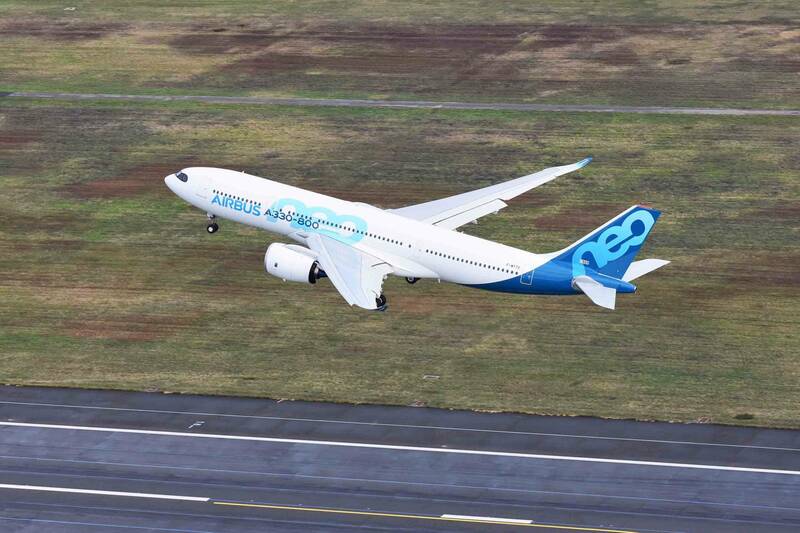 Firm orders for the A330neo topped 224 from 14 customers at the end of September, but all for the -900. Delta Air Lines signed as the launch customer of A330neo and TAP Air Portugal as the launch operator. Air Asia X remains the biggest customer, holding an order for 66. Upgrades of the A330-200 and -300 respectively, the A330-800 and A330-900 can seat 257 and 287 passengers in a typical three-class configuration. The -800 offers a capacity of up to 406 in a high-density LCC configuration.